Walsall v Doncaster Rovers: Is lightning about to strike twice for Rovers? 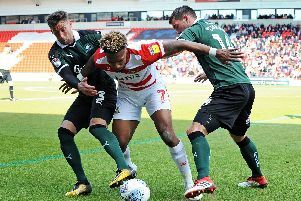 Darren Ferguson hopes lightning might strike twice as Doncaster Rovers bid to return to winning ways at Walsall tonight. Rovers are without a win in eight games although they have lost just one of their last 11 league matches. This time last year they suffered a similar dip in February before a victory later in the month at Cambridge United sparked their promotion charge. And Ferguson is confident his men will re-discover that winning feeling sooner rather than later. “Funnily enough, slightly later than this, 12 months ago we had a similar run when we went five games without winning,” said Ferguson. “We lost at Carlisle and we had four draws. It’s not too dissimilar to now - and we then went on and kicked on again. “So there’s a lot of similarities to last season in the run we’ve gone on at this stage. “We’ve conceded from too many set pieces. That’s the clear stat that stands out and that’s probably the clear reason why we’ve not been winnning games. “But we can certainly get back to winning games, there’s no doubt about that. Tonight’s opponents Walsall sit one place below Rovers, two points worse off. Mathieu Baudry, who has missed the last three games with a hamstring problem, returned to training yesterday and is set to be added to the squad this evening.